Babylon was a major city of ancient Mesopotamia in the fertile plain between the Tigris and Euphrates rivers. The city was built upon the Euphrates and divided in equal parts along its left and right banks, with steep embankments to contain the river's seasonal floods. 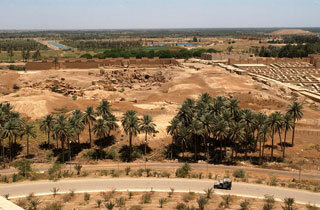 Babylon was originally a small Semitic Akkadian city dating from the period of the Akkadian Empire c. 2300 BC. This article uses material from the Wikipedia article "Babylon", which is released under the Creative Commons Attribution-Share-Alike 3.0 License.